A final thrust of the crowbar cracked the wooden crate open, and the architect, the anthropologist and the mortar expert leaned in to look at the oddity that had drawn them to an out-of-the-way warehouse on a glimmering spring morning. It was a 3-foot-by-10-foot section of timeworn brick wall, its predictable rows abruptly interrupted by three distinct, deliberate-looking triangular shapes. Though once part of a warehouse, it now raises nothing but questions. Painstakingly preserved from a 175-year-old building in lower Manhattan, the brickwork symbol is — at least to some — part of a tantalizing historical mystery. The setting conjures both New York City's mercantile past and its future, and those who may be involved include the founder of a prominent American corporation. Could the design be a cryptic marker of mystical beliefs? A tradesman's signature? A bit of architectural shorthand? Or a creative way to patch a hole? Speculation — some backed with scholarly authority — has swirled around the possibilities, generating enough gravity to pull in community leaders and persuade a developer to spend $13,000 to save the artifact from demolition. The symbol's significance may never become clear, but enthusiasts say its value lies in the questions it has raised, whatever their answers. "Whether you believe in this stuff or not, it suggested so much and pointed to so many things," said Alan Solomon, a volunteer historian who pushed to preserve the symbol and probe its meaning. "It's just a cabinet of curiosities." 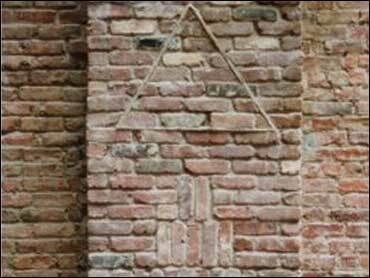 The design is simple, but clearly intentional: It centers on a triangle framed with a strip of mortar, framed by two rougher triangular forms. Whatever its origin, the symbol sat unheralded for years inside a building on Pearl St., at the edge of New York City's financial district. Solomon, who works for a Brooklyn vintage-lumber dealer, spotted the artifact several years ago while engaged in an effort to save the 1832 building. Most of the building was demolished to make way for a parking garage for a new apartment tower, financed in part with tax-exempt bonds intended to spur redevelopment after the Sept. 11 terrorist attacks. But the facade and the brick symbol were saved. City tax records show the building, a onetime warehouse, was built for William Colgate — the civic-minded, deeply Christian soap entrepreneur who founded what is now Colgate Palmolive Co. and helped establish the American Bible Society. A spokesman says Colgate Palmolive has no record that the company, then headquartered elsewhere in Manhattan, used the Pearl Street building. But Colgate prized it enough to make special note of it in his will, Solomon said. To Solomon and some historians, Colgate's ties to the building suggest the brickwork pattern has Christian resonance. The triangle has traditionally been used to represent the Christian concept of the Holy Trinity. Some scholars, while stressing the need for more research, think the Pearl Street symbol evokes esotericism — efforts to delve for divine meaning in numbers, geometry, nature and elsewhere. The symbol was even the subject of a presentation at an academic conference on esotericism in Amsterdam in 2005. The triangular forms could encode an esoteric message in their proportions, said Joscelyn Godwin, a Colgate University music and medieval studies professor who examined esoteric ideas in "The Theosophical Enlightenment." Alfred Willis, a scholar of esotericism's influence on architecture and a university librarian at Hampton University, suggested that the proportions may point to Bible verses. No one has claimed to be sure of the artifact's historical merit, and some have questioned whether it has any. They include Rockrose Development Corp., the company building the new tower on the Pearl Street site. Rockrose's construction experts placed the brickwork pattern sometime in the 20th century, company planning director Jon McMillan said. But the developers agreed to pay for removing the artifact intact after fielding requests from Solomon, City Councilman Alan J. Gerson and others. Tests in June dated the mortar to 1950 or later, though the bricks themselves may be older, said John Walsh, a mortar expert and geologist at Testwell Laboratories Inc. in Ossining, N.Y.
Solomon is now trying to track down recent owners and occupants of the Pearl Street building. He wonders whether the artifact might have originated in the 19th century and later been reassembled with modern mortar. Solomon and others who have come together around the brickwork object say they feel its pull as an imprint of human inventiveness, if nothing else. "Whether it was made in the 1970s or it was made in the 1850s, somebody still made this thing," Rocco Leonardis, an architect and brick aficionado, said as he looked it over in its warehouse crate. "No matter how we slice it, it's meaningful."